The Brush palette contains most of the controls related to sculpting 3D models. There are many brushes you can sculpt with in ZBrush 4R5. Each brush has a unique property that allows it to do something the other brushes can not. 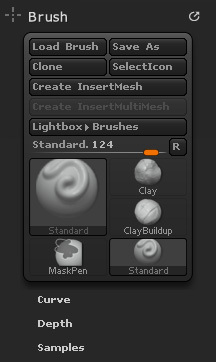 Also, brushes in ZBrush can be modified using several important controls such as Gravity, Wrap Mode or Density. The Alpha palette controls the shape of your brush. An alpha is a grayscale intensity map. The Stroke palette controls the way your brush moves over the surface of your model. There are several strokes that can be used in 3D: Dots, Freehand, Spray Stroke and Drag Rectangle. Brushes can also be saved and loaded by using the Brush:Load and Brush:Save As buttons. Saving a brush saves all of the settings in the Brush Palette as well as certain preferences, stroke settings and alpha settings. Press Clone to duplicate the currently selected brush. It is a good idea to Clone a brush before saving it so you don’t overwrite a default brush. When the Create InsertBrush button is pressed a new InsertBrush will be created from the selected SubTool. The orientation of the mesh to the camera will set the orientation of the mesh when drawn out. When the Create InsertMultiBrush button is pressed a new InsertMultiBrush will be create from all SubTools. The orientation of the meshes to the camera will set the orientation of the meshes when drawn out. All but a few items will be hidden; they can be retrieved by pressing the large thumbnail and selecting them from the popup palette. The Quick Pick recent items section of the pop-up palette will also be reset. The Edit Brush Credit button enables you to add a name and web address to a brush. This is so that if you share any custom brushes, users will know who made them. The credit will appear in the pop-up info that appears when the cursor is over the brush thumbnail. When Reset All Brushes is pressed all Brushes will be reset to their default settings.